It is no surprise that Broadway musicals have embraced the world of multimedia. In my review of Ghost:The Musical, I even prefaced how as appealing as it is, it sometimes is a detriment to the overall production. 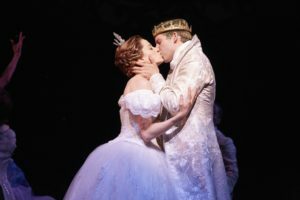 The installment of more mediums on stage has increased to a point where sometimes the actor and music play second fiddle to the videos, music tracks and special effects that take to the stage. They almost become a character themselves. 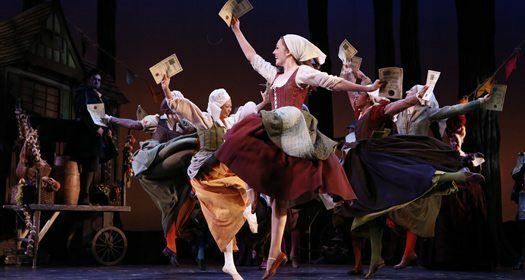 It begs the question, how were musicals produced before the digital age? Cinderella, at the Straz Center in Tampa, Florida, answers this question, and successfully I might add. Entering the lobby of the Straz Center, on Tuesday night, felt as if I was going to be attending a Grand Ball myself. Numerous families had brought their young girls whom were dressed up like princesses about to attend a coronation. Therefore, it was a wonderful sight as fewer and fewer productions, that are completely family friendly, are being produced. Carol Marsoni Hall was fired up with opening night energy which allowed me to reminisce about my own time on stage. The aura was intoxicating and the addition of the youthfulness, in the theatre, just made it more so. But of course, I digress. 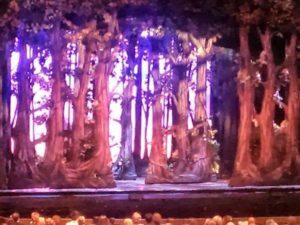 As I took my seat I could see on stage what looked like a forest with several trees and greenery painted on set. It greeted the audience with a nice surprise. The set was not, in any way shape or form, trying to pass itself off as reality. While it was done professionally, it foreshadowed a different place and time where the suspension of belief could easily be ensued. As the show began it did just that. Transported us to a different land where magic could exist and the most fantastical dreams could come to life. The tale is the same. Cinderella, having been orphaned by her father after he died, is a slave to her surviving step-mother. With her biological children, she continues to keep Ella (the name she goes by at the start of the show) busy while continually find ways to ridicule her. At the castle, Prince Topher has just completed his schooling and has come of age to be crowned king. In order to marry him off, Sebastian, his trusted advisor, organizes a ball. It gave the prince an opportunity to meet all of the eligible ladies of the kingdom. Of course Cinderella’s step-mother will have no part in allowing her to attend. With the help of Ella’s Fairy God Mother, Marie, she is able to appear at the ball anonymously. The problem is, the magic used for her dress and carriage will only last until midnight, at which time her dress will return to her rags, the carriage will return to being a pumpkin and her footman will return to the forest as a raccoon and fox. The Prince and Ella meet, and before she can even give her name, midnight arrives and she rushes into the night. The Prince, now completely obsessed with finding Ella, spends days and nights looking for her. There are some slight detours from the original story and some modern comedic language added. The outcome is the same and some nice additions are made that include some wonderful lessons for the youngsters and adults as well. To get to the point, I absolutely loved this production. It especially resonated with me because the production was almost completely, for lack of a better term, analog. There was no digital media. There were no videos, and nothing seemed to move automatically. Everything was done via human locomotion. From the Cinderella’s rags turning into her fabulous gown, to Marie (the fairy godmother) flying. It was completely, done via “old school” theatre, using ropes & pulleys, under-dressing, and wheels with the help of the stage crew and the actors. 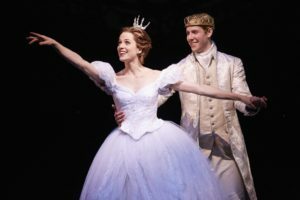 Paige Faure’s portrayal of the naïve, kind and generous Cinderella, was as sincere of a performance I have ever witnessed. Her incredible singing carried her emotion through the house where the audience could do nothing but root for her to the very end. With a different naiveté came Prince Topher, played by Andy Jones. His voice not only beautifully melded with Paige, but it also showed the maturity of harmonizing with the rest of the ensemble. While this show was completely family oriented, there was no doubting the attraction between the two leads. I couldn’t help but being held with anticipation awaiting for the two to finally find each other. This was a full ensemble piece and what was so intriguing was every member of the ensemble allowed for each of the characters to stand out. This includes the incredible resonating voice of Adrian Baidoo portraying a page with some short solos that were very memorable. Every actor was fully committed to their characters where it seemed like character and actor became one in the same. The dance numbers were executed to perfection with no one single dancer pulling focus from the ensemble as a whole. Every member of the dance ensemble appeared to be classically trained which made every movement jaw dropping and attracted the focus of every eye in the house. Blake Hammond’s Sebastian was ruthless but fun. Crazy Marie/the Fairy Godmother, played by Kecia Lewis, had a voice that carried through the audience. It brought us back to our childhood when we actually believed in magic. Step mother, Beth Glover was hilarious as was her daughter Charlotte, Aymee Garcia . The comedic choices created a duplicity for the audience to choose to like them instead of just wishing them to be gone. I can go on and on about this performance and I have nothing bad to say. The only small, tiny, petty thing I could point out, was a technical issue. The sound in the first number “Me, Who am I?” which was a solo with ensemble harmonies. It was very difficult to hear the solo lyrics. However, the balance between soloist and ensemble was corrected for the following numbers. As a former performer, designer and director, I would chalk that up to opening night adjustments. 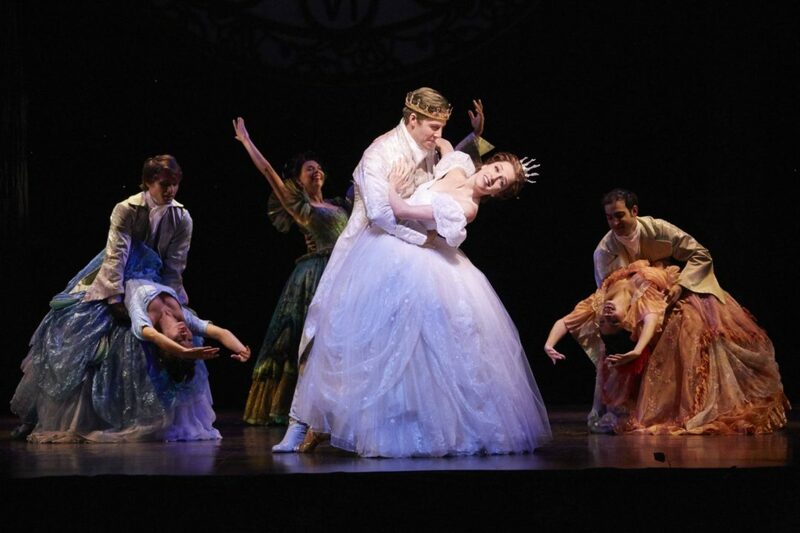 Cinderella at the Straz Center is a production that is a must see for every one of all ages. I highly recommend attending a production before it leaves the area. Cinderella plays at the Straz Center, through Sunday October 26th, Wednesday & Thursday at 7:30pm, Friday at 8pm, Saturday at 2 and 8pm, and Sunday at 2 and 7pm. I read your review and it solidified my idea to take Allison to her first theater show. When I told my husband he disagreed. He said he was escorting her on a daddy daughter date. She will love it. I hope tickets are still available.